Rugby history: video of England's first international released! The Welsh RFU have been doing wonders since the men's and women's unions merged last year. One major project has been tracing their national women's team's history - a project that probably puts them ahead of pretty much any other union anywhere. Their latest is a real gem. Video of the first ever England v Wales women's rugby international - a game which was also the first international for both nations. The game took place at Pontypool Park on 5th April 1987 - and England and Wales have played at least once a season ever since - 23 times in all - making it comfortably the the longest-running series in women's rugby... and England have won every game. A "Great Britain" team had played the season before - losing 14-8 to France at Richmond - so for many of the the players this was not quite their first international, but this is still a very early event in the history of the game. 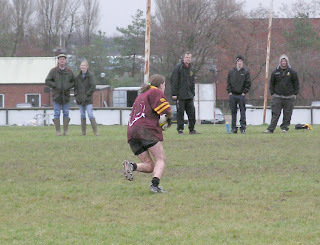 The first inter-club tournaments in the UK had only started the season before, most players would have been playing for a handful of years, and it would be another seven years before the RFUW would be formed - the quality of play (and come to that the size of the crowd) is therefore all the more impressive. 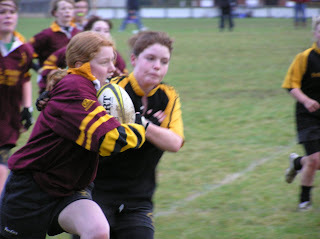 Our U18 county girls will see at least one familiar face when they play against Canada's U19s next Saturday. IE Weldon's second row Lauren Wizowski is now seasoned member of the Canadian U19 squad - in fact she appeared for them against England and Wales last season, fitting the Weldon tour in between the internationals! - so, although still only 18, she is one of the party's "senior" players. As some of you may know, I've been doing some research into the history of women's international rugby for the past eight months or so. I'm not actually sure quite I can remember why any more, but its been an interesting project. Anyway - as well as producing several pages of information on Wikipedia - I thought I might put it into book form via the Lulu.com that we use to produce the calendars. So I have, and here it is - http://www.lulu.com/content/1715790. About half of the proceeds from every sale will go to the team (the rest goes to the printer - I don't get a bean!). Its not a great read - mainly lots of statistical data - but if you are into that sort of thing then this is for you. And even if you aren't then... well I am not aware of any other book on the subject! All Sunday training is to be confined to the top pitch and the old "fourth team" pitch (which will be marked out as a junior size pitch) and the spaces between the second and top pitch for all age groups, incl boys and girls. Training on the middle pitch will only be allowed on midweek evenings. 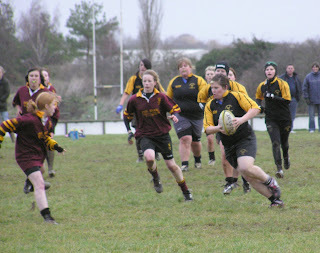 Sunday training for the juniors and girls will take place between 11:30 and 1pm (minis will be from 10.00 to 11.30). Girls matches will kick off at 2pm (this allows changing rooms to be cleared after any boys matches, which will kick off at 12.00). Warm-ups from 1.30, but not on first or second team pitches (ie. middle or bottom picthes). In practice this makes little difference to us, other than the slightly later time for training if we ever train on a Sunday. Home matches will, however, be confined to the top pitch for U18s and "fourth team pitch" for U15s (if played at the same time - there are plans to re-erect posts on the fourth pitch, apparently) until things improve, ie. the spring presumably. Just a reminder that there will be no training or game now until Thursday 3rd January. This allows us to take full advantage of tomorrow's cancellation and ensure that everyone will be as fit as possible for the second half of the season. However, before then potentially five of our girls (ie. Charley, Hayley, Jess Katie and Laura) will be in action for Hertfordshire against Canada U19s at Welwyn on the 29th (checkout the Herts Blog for details). I am sure that they would welcome some familar faces on the touchline cheering them on - or provide them with warm drinks and conversation if they are bench-warming. Finally, if you are feeling rugby withdrawl symptoms this weekend you can watch England's international with the USA this afternoon. They are playing at London Irish this year instead of OAs, but you can watch the match LIVE on www.247.tv (2.30 kick-off)- £2.50 you can watch the match live, to replay a match costs £1. The match is England’s first international of the season since the Grand Slam last March and the first under new Head Coach Gary Street. 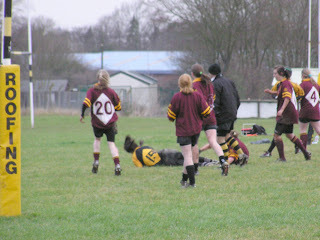 England last played the Eagles in the 2006 IRB Rugby World Cup and won 18-0 - but I'd expect rather more tries this time. I firmly believe that the comments section of a blog should be as open as possible, not restricted by passwords or limited to Letchworth players or supporters, so that as free a range of discussion as possible should be allowed. However recently a growing number of, at times, silly comments by anonymous contributors (especially anonymous contributors pretending to be club members) to some debates has begun to annoy some people in the team. So (as a trial) all new anonymous comments will be deleted - not just abusive remarks, as now. This means that you will have to enter a name or nickname of some sort. As a means of controlling abuse of the systems its about as low key as you can get, and if it works then fine. If not then there are other weapons available - including tracing back URLs if need be - which could be a bit tedious but something I am quite happy to do in order to keep a lid on things. Further to Sunday's game, Phil has provided a short video illustrating Natalie's hunting technique. Sudbury cancel... you'll never guess why! The on-going injury crisis/series of increasingly remarkable coincidences/ staistical blip (delete as applicable) contines with Sudbury now having to cancel Sunday's fixture. Until a couple of weeks ago it was looking like we were going to have to cancel, but after last weekend we looked to have something close to team (certainly with Ampthill's help anyway) - so this is a bit of a shame. Not sure where we stand now - but in practice I suspect that a training weekend would be no bad thing. A few who played last weekend are still carrying injuries that are not fully healed, which might be okay against newcomers like Ampthill but against major opposition like Sudbury (or Basford, who were also likely to attend) risked being inflamed. With no major games now until the New Year (county game against Canada aside) we can now be reasonably confident of starting 2008 with a full team - something we have never come close to managing throughout this season to date. As for what we do this Sunday... watch this space. Well, so it seems from what Randy says because I'm not sure that she does anything else! Its worth mentioning that yesterday was Randy's second game of the week as she is now a firm member of the adult Army Medical Services (AMS) team (and the youngest member too!). 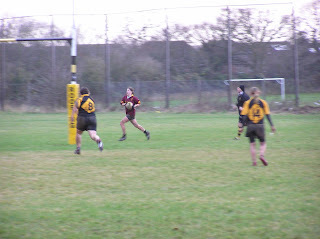 Apparently she scored a try in their game against REME (who Randy used to play for, I thought?) on Wednesday. Talking to Randy about her experience of the adult game the main thing that comes over is how much faster the game is, and how much bigger the hits are. 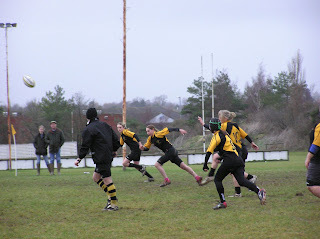 Our speedy wing plays at outside centre for AMS and was spured on by a gallery of supporters for her game. Randy's next game for AMS is against the Adjutant General's Corps on 5th January - but before then the good news is that she will be coming with us to Sudbury next weekend as she has two week's leave. 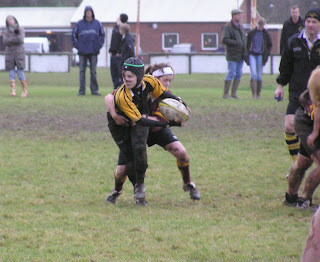 It is interesting to see how much Ampthill are improving. Despite having one or two of their leading lights absent (apparently) the opening exchanges, and most of the match, was better contested than previous games. 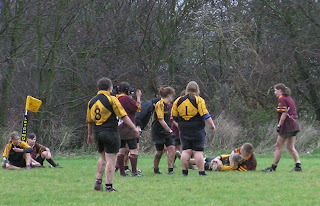 Unfortunately rugby is a cruel game, and relatively small differences between teams can often be exaggerated in the final score, especially if you cannot break out of defence, so even though the improvement was clear for those of us watching it has yet to have an impact on the actual score. They are certainly wiseing up at penalties - as we learnt for their first try - a bit of a sucker punch that! Actually, one is actually slightly tempted to suggest that maybe giving away a 10m penalty for not retiring might be better than waving them through when caught out in situations like that. Anyway - it was good fun, pressure-off, confidence building stuff. There were a few errors early on that we would not have got away with against higher level opposition - blind passes into no-where, passes not going to hand and so on - so there is still room to improve, but the main plus was getting through an entire weekend with as many fit players as we started. Here's hoping that continues! It was extremely convenient that the heavy rain that had poured down all morning stopped just in time to allow at least the spectators to remain relatively dry while watching the U18s girls match with Ampthill. Unfortunately, it remained rather murky thus giving me the ready made excuse for blurred and dark pics : it was just too dark to get really good ones! 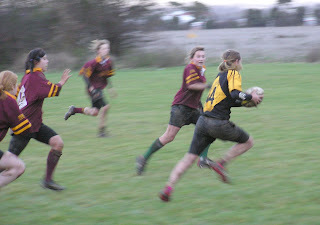 For the first time ever a photograph from a women's match has been selected as the IRB's Rugby Photograph of the Year. 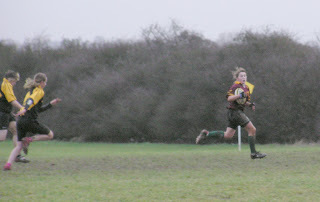 The winning shot, titled ‘Commitment’, depicts Rachel Poolman, the Wales fly half, shielding herself from the torrential December rain during her side’s 31-7 victory over Italy at Glamorgan Wanderers RFC in Cardiff, Wales in December 2006. Taken by a professional photographer named Andrew Orchard it was voted the best from over 100 entries from around the world. “Andrew’s image is particularly striking in that it encapsulates the true spirit of the Game. The fact that it was taken at night and in the pouring rain certainly adds to the atmosphere of the occasion where the commitment of the two teams really comes to the fore. This is an image that all who have played the Game at any level can relate to and is a worthy recipient of the IRB/Emirates Rugby Photograph of the Year award,” said International Rugby Board Chairman, Dr Syd Millar. 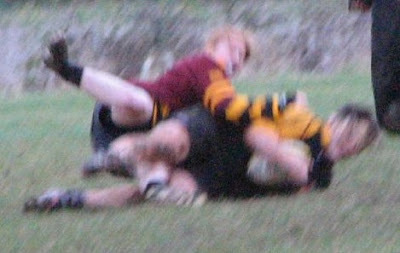 “The game was played under floodlights at Glamorgan Wanderers RFC which can be a little dark, so when it started raining I knew that there was a chance of shooting something a bit different. I think the rain was at its worst when I took the shot. 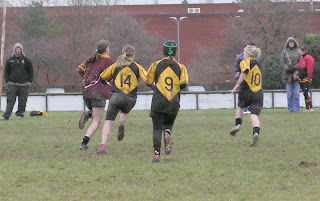 In the background the girls are preparing for a scrum and Rachel just turned her back for a few seconds, I think she was trying to shield herself from the rain. To be honest she looks like she wants to be somewhere else, and that is pretty much how I felt at the time too,” said winning photographer Andrew Orchard. Quite how the competition works - ie. who can enter - isn't clear, but maybe it might be worth dropping the IRB a line to see if something from the the Alcock or Threlfall Photographic Agencies might be suitable for next year's competition? I've just received my copy of the "Community Magazine" - and our bit is pretty impressive. 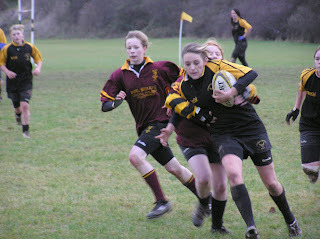 A full colour, two-page spread with pictures of both the U15s and U18s, including a big full-page job featuring Jess. We are also the only sport featured! Really well worth getting a copy, presumably from The Comet offices if you do no actually live in Letchworth. The article itself is based around Katie's now world-famous speech, edited down a bit. It reads very well - we could never hope to buy publicity as good as this so... fingers crossed that we get some interest from it! It's that time of year again - the time when, if you're anything like me, you sit in desperate gloom contemplating the awful question of what can you possibly buy for granny this Christmas? Or uncle John? Or countless other family members who, for one reason or another, are so difficult to find an appropriate present for. Well, stop your fretting! 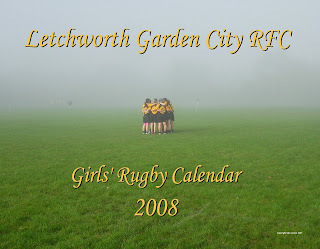 Help is at hand in the shape of the 2008 Letchworth Girls calendar. Following the success of the 2007 version, we have produced this calendar with even more pictures - a total of 53 full colour pictures taken during 2007 are presented; 46 of which have not been published anywhere before. 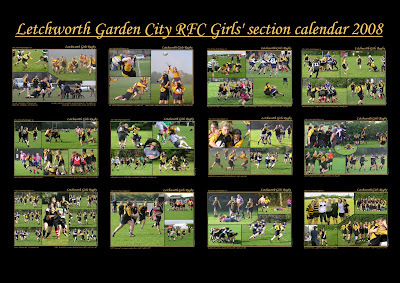 The calendar is available from the printer at www.lulu.com/content/1495619 at £9.99 plus postage & packaging from the USA or from Mike Alcock (mikealcock@lineone.net) at £10. Please note that, if you need Mike to post one to you in the UK, it will cost an extra £1 for First Class post & packaging. All proceeds go to Letchworth Rugby Club Girls. With Christmas just a matter of 23 days away, it's high time you Letchworth Girls got yourselves some serious training organised - Simon is suggesting a visit to Pizza Hut followed by a game of bowling on Wednesday, 12th December and needs to know who will be coming along so he can make the necessary bookings. Please let him know as soon as possible (and definately by Thursday 6th) if you will be there.